21. Blackened　22. Nothing Else Matters 23. Enter Sandman/The Frayed Ends of Sanity 0utro　24. Outro　25. Closing　... Approx: 152min. 01. The Ecstasy of Gold (SE) 02. Intro (SE) / Hardwired 03. Atlas, Rise! 04. For Whom the Bell Tolls 05. The Memory Remains 06. Kirk's Guitar Solo #1 07. The Unforgiven 08. Now That We're Dead 09. Moth Into Flame 10. Harvester of Sorrow 11. Halo on Fire 12. Rob's Bas Solo(Incl：The End of the Line) 13. Anesthesia (Pulling Teeth) 14. Whiplash 15. Sad but True 16. One 17. Master of Puppets 18. Kirk's Guitar Solo #2 (incl.：Leper Messiah) 19. Fade to Black 20. Seek & Destroy -Encore- 21. Battery 22. 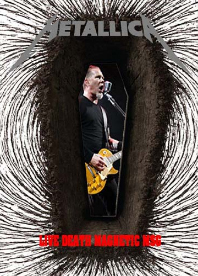 Nothing Else Matters 23.Enter Sandman 24. Fire Works 25. Outro... Aprrox: 137min. 01. Breadfan > 02. The Four Horsemen 03. Battery 04. Sad But True 05. Kirk's Guitar Solo 06. Fade to Black 07. Atlas, Rise! 08. Harvester of Sorrow 09. Moth Into Flame 10. Rob's Bass Solo 11. One > 12. Master of Puppets > 13. For Whom the Bell Tolls 14. Enter Sandman Encore: 15. Whiskey in the Jar 16. Hardwired 17. Seek & Destroy 18. “Happy Birthday Kirk” 19. Outro...Approx: 108min. total : 4 hours. 13 min. 1. THE ECSTASY OF GOLD/2. BATTERY/3. MASTER OF PUPPETS/4. FOR WHOM THE BELL TOLLS/5. RIDE THE LIGHTNING/6. WELCOME HOME (SANITARIUM)/7. SEEK & DESTROY /8. CREEPING DEATH/9. AM I EVIL?/10. DAMAGE, INC.
1. MASTER OF PUPPETS/2. FOR WHOM THE BELL TOLLS/3. RIDE THE LIGHTNING/4. WELCOME HOME (SANITARIUM)/5. SEEK & DESTROY/6. CREEPING DEATH/7. AM I EVIL? /8. DAMAGE, INC.
1. BATTERY/2. MASTER OF PUPPETS/3. FOR WHOM THE BELL TOLLS/4. FADE TO BLACK/5. SEEK & DESTROY/6. CREEPING DEATH/7. AM I EVIL?/8. DAMAGE, INC.
Live at Cidade do Rock, Rio de Janeiro, Brazil on September 19, 2015 Linear PCM Stereo + Dolby 5.1 Surround total 135min. Live at Grant Park, Chicago, Illinois, USA on August 1, 2015　130min. Live at National Mall, Washington, DC, USA on November 11th, 2014 total tome 182min. Live at Velodromo Del Estadio Nacional, Santiago, Chile on 4th May, 1993 153min. 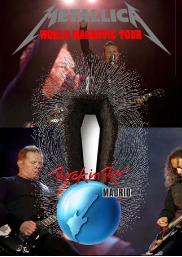 Live at Estadio Velez Sarsfield, Buenos Aires, Argentina on 8th May, 1993 129min. Live at Werchterpark, Werchter, Belgium on July 3rd, 2014 total 142min. Live at Megaland, Landgraaf, Holland on 9th June, 2014 total time 160min. Live at Milton Keynes National Bowl, Milton Keynes, UK on 5th June, 1993 122min. Acoustic Live at Club Nokia, Los Angeles, California, USA 12th May 2014 Approx.20min. Live at the Spectrum, Philadelphia, Pennsylvania, USA on March 12, 1989 111min. Live at the Colbert Report, New York City, NY, USA on September 24th, 2013 total 91min. Live at Chiba Marine Stadium, Chiba, Japan on 10th August, 2013 TOTAL 189min. Live at Zeppelinfeld, Nuremberg, Germany on 1st June, 2012 toatl time:177min. diisc two:1.SEEK AND DESTROY/2....AND JUSTICE FOR ALL/3.JAM #1/4.CREEPING DEATH/5.FADE TO BLACK/6.GUITAR SOLO/7.BATTERY/8.JAM #2/9.LAST CARESS/10.AM I EVIL? MAKING OF I DISAPPEAR TOTAL 245min. Live at Griffiss Air Force Base, Rome, New York, USA on July 24th, 1999 total 217min. Live at Ullevi Stadium, Gothenburg, Sweden on 3rd July, 2011 363min. 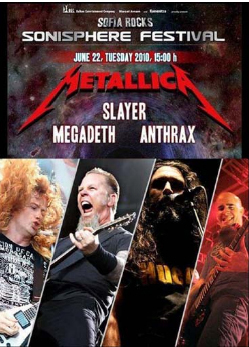 Live at Vasil Levski Stadium, Sofia, Bulgaria on 22nd June, 2010 TOTAL: 229min. Live at Knebworth House, Stevenage, England on 2nd August, 2009 total:175min. Live at Rock Werchter, Werchter, Belgium 5th July, 2009 109min. 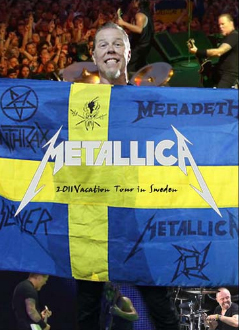 Zane Meets Metallica 2008:Documentary & Interview with James Hetfield and Lars Ulrich total:107min. Live at Key Arena,Seattle,Washington,USA December 1,2008 total:252min. Live at the Auditorio Telmex,Guadalajara,Jalisco,Mexico 16 October,2008 TOTAL 188MIN. 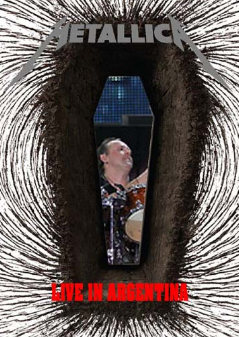 ESPECIAL TELECINCO:DEATH MAGNETIC:1.INTRODUCTION2.ITERVIEW/3.THE DAY THAT NEVER COMES (promo clip) TOTAL 95min. 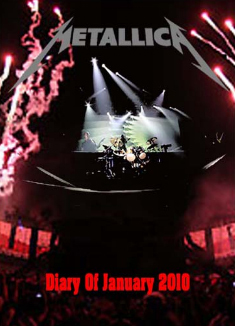 A CULTURE SHOW SPECIAL:Behind the scenes Metallica on tour in Bergen,Norway on 16th July,2008.This features interviews and short clips of rehearsal and live performance. Live at Nurburgring,Eifel,Germany 7th June,2008 133min. Live at Parque da Bela Vista,Lisbon,Portugal 5th June,2008 124min. Live at Bonnaroo,Manchester,Tennessee,USA 13th June,2008 109min. 歴史的名盤『MASTER OF PUPPETS』全曲演奏を初披露し世界中のメタリカ・ファンのド肝を抜いた、2006年6月3日ドイツ、ニュルブリグリングで行われたROCK AM RINGフェスのプロショット映像がフットストンプレーベルより登場! Live at Donington Pak,England 6/9,10,11/2006 total time :96min. Live at Rock am Ring Festival,Nurburgring,Germany 6/3/2006 148min.